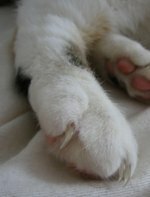 A swollen cat paw can be a sign of injury, disease, sting, bite or infection. Your cat likely will protect the paw, lick it excessively or avoid bearing weight on the painful foot. If your kitty will let you examine her, you may be able to identify the problem and implement basic care at home; however, cats in pain are prone to scratching and running, so veterinary attention is usually a necessity. A cat with a paw injury may not want to bear weight on the sore foot. A broken or sprained foot or toe can lead to paw swelling. Your cat may hold her injured paw at an odd or unusual angle. Puncture wounds from things like nails or sharp objects can cause swelling. Examine your cat's paw closely for visible signs of trauma and check for anything that might be wrapped tightly around a foot or tow, such as string or plastic, and remove it to restore circulation. If your cat has a sharp object lodged in between her toes or embedded in her paw, it could lead to pain, swelling and tenderness. You may notice a discharge or feel the paw is warm to the touch, which are signs of infection that likely will require prescription antibiotic treatment. If you can, safely remove small objects such as pebbles or thorns, wash the paw and apply a topical antibiotic ointment. If swelling persists or an object is deeply embedded, seek a vet's attention. Swelling can be a sign your cat was stung by an insect or bitten by a rodent or other small animal. This can trigger a potential allergic reaction or lead to infection. Your cat also may have come in contact with a toxic substance, such as a lawn chemical or cleaning product, that irritated her sensitive foot pads. If you think this is the case, gently wash the foot pad and seek medical attention. If your cat shows signs of allergic shock, such as vomiting, loss of bowel and bladder control or respiratory distress, seek medical help right away. While regular scratching keeps most cat nails at a suitable length, overgrown cat claws can puncture paw pads and lead to swelling. Puncture wounds can be prone to infection, so veterinary attention is advised. Overgrown claws also can be a sign of a chronic disease, so if this is a regular occurrence for your cat, talk to your vet about potential causes and treatment options. Your vet may be able to determine the cause of your cat's paw swelling through a physical exam. Sedation may be necessary if X-rays are needed. Treatment options will vary based on the underlying cause of the swelling. Infections are often treated with antibiotics and topical ointments or anti-inflammatory medications to reduce pain and swelling. Torn ligaments may require surgical repair. Once home, your vet probably will instruct you to apply ice to your cat's injured paw to help reduce swelling. Crushed ice in a plastic bag or a bag of frozen vegetables works well. You may need to limit your cat's physical activity if she suffers a serious injury, such as a broken bone, or requires surgery to treat her condition.